Interviewer: You are very critical of the media coverage on Syria. What is bothering you? Father Daniel: “The idea that a popular uprising took place against President Assad is completely false. I’ve been in Qara since 2010 and I have seen with my own eyes how agitators from outside Syria organized protests against the government and recruited young people. That was filmed and aired by Al Jazeera to give the impression that a rebellion was taking place. Murders were committed by foreign terrorists, against the Sunni and Christian communities, in an effort to sow religious and ethnic discord among the Syrian people. While in my experience, the Syrian people were actually very united. Interviewer: Mother Agnès-Mariam, of your Mar Yakub (“Saint Jacob”) monastery, is accused of siding with the regime. She has friends at the highest level. 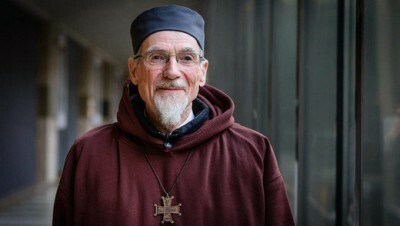 Father Daniel: “mother Agnès-Mariam helps the population: she has recently opened a soup kitchen in Aleppo, where 25,000 meals are prepared five times a week. Look, it is miraculous that we are still alive. We owe that to the army of Assad’s government and to Vladimir Putin, because he decided to intervene when the rebels threatened to take power. Interviewer: You say that the Syrian Army protects civilians, yet there are all sorts of reports about war crimes committed by Assad’s forces, such as the bombardments with barrel bombs. Interviewer: You once mentioned Hillary Clinton to be a ‘devil in holy water’, because as foreign minister, she deliberately worsened the conflict. Father Daniel: “I am happy with Trump. He sees what every normal person understands: That the United States should stop undermining countries which possess natural resources. The Americans’ attempt to impose a unipolar world is the biggest problem. Trump understands that radical Islam is a bigger threat than Russia. Interviewer: You understand that your analysis is controversial and will encounter much criticism?